Spring is here! Well we finally can say with some conviction that spring will be here soon. There is no doubt that this winter will go down in the history books as one of the snowiest and coldest periods we have ever seen, especially for us New Englanders. But enough about that, let us look forward to all of the wonderful things upcoming over the next few months while spring gives way to longer days and warmer nights. This spring we are continuing our Round Tables and Educational Seminars, so if you have yet to attend or want to attend again we look forward to seeing you soon! Also, we are excited to be working with the Connecticut food bank to help out the hungry and impoverished in our state, and we hope you will join us! It’s hard to believe that April 15th is right on our heels and in addition to making sure you get your paperwork in to the IRS on time, tax day is also a great time to evaluate your overall financial plan, goals and objectives. If you are one of the fortunate ones to receive a refund, those dollars can also make a great unexpected contribution to one of your retirement and/or investment accounts. 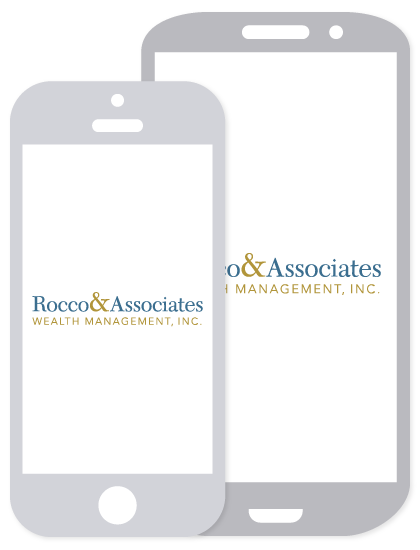 At Rocco & Associates we pride ourselves on the idea that we want to be much more than your wealth manager, we want to be your life manager. Part of this philosophy is to be your point of contact for all aspects of your life. Over the years we have forged strong relationships with many avenues of influence, including a tightly help group of specialized attorneys, P&C agents, mortgage service providers and proven CPAs. Therefore if this year you are in need of a new accountant to assist in your tax preparation or a second opinion on a legal matter, please don’t hesitate to call the office and speak with our team about potential solutions. Here at Rocco & Associates, we love interacting with existing clients as well as being introduced to new ones. Hopefully you have received several communications about our office move in November and now that we are all settled in, we would like to invite all of you to our Spring Open House. This May, we will be hosting an open house for everyone to come in and take a look around our new space (as well as enjoy food as refreshments of course). We think you will all agree that the new space, with its open floor plan and abundance of natural light, is almost as comfortable as your own family room. We encourage you to bring a guest, neighbor, coworker, or family member; with a larger space come a larger range of services offered. We are better equipped than ever to help you, your family, and your friends stay informed in the current economic landscape. The articles that are included in this communication are carefully selected by the team here at Rocco & Associates. We strive to make them as relevant as possible in light of our clients’ needs and what is happening in the world around us. However, they are not and should not be seen as confidential publications. We encourage you all to forward them to a friend, neighbor or anyone else that you feel may benefit. Should they want to be included on our communication lists in the future, even if they are not clients, feel free to forward their email addresses and/or call the office to add them. There is also a link after all the articles. Some of this information is just too valuable to keep to yourself!